It was a busy few days (now two weeks ago) for Team List with various adventures on Friday, Saturday and Sunday at the end of a week that started with the Coal Vaults launch, National Burger Day and Science Museum Lates. First up - Friday night (30th August) at Camden Town Brewery. I have been meaning to go to Camden Town Brewery for a long time, but I finally made the journey up north after finding a flyer for Wholey Cow at National Burger Day. 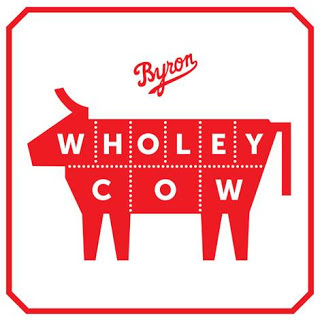 The Byron Van and Fred Smith had bought a cow, and were cooking the whole thing over the course of two days outside the brewery bar - how could I resist? Team List wandered over from Chalk Farm to find Kentish Town West Station where the brewery is situated, and got stuck straight into the beer. 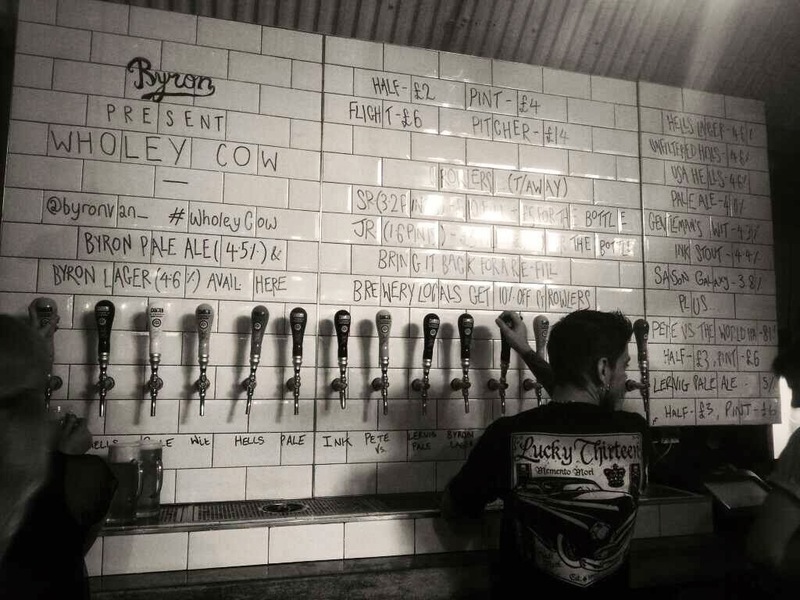 Camden Town beers have already spread all over London, so we tried a couple of rarer brews in the form of their Saison Galaxy and US Hells Lager, as well as a pint of Byron's Pale Ale that was on tap. They also had some interesting guest beers on offer, including Lervig Pale all the way from Stavanger in Norway. Several beers did run out over the course of the evening so make sure you get there early if you want to have the most choice. The Byron Van queue started to grow so I got involved and ordered us some burgers, fries and mac'n'cheese hash browns (awesome). They handed out tasters of their Bloody Bull cocktail to keep the queue happy - made with beef stock, it tasted like alcoholic tomato soup, in a good way. The queue suddenly grew to a crazy length, and I don't think I would have bothered queuing up if I had turned up later. You also need to turn up early if you want to grab a seat anywhere - we managed to squeeze ourselves on to a cosy table in one corner, even with one of our number bringing most of a drumkit. 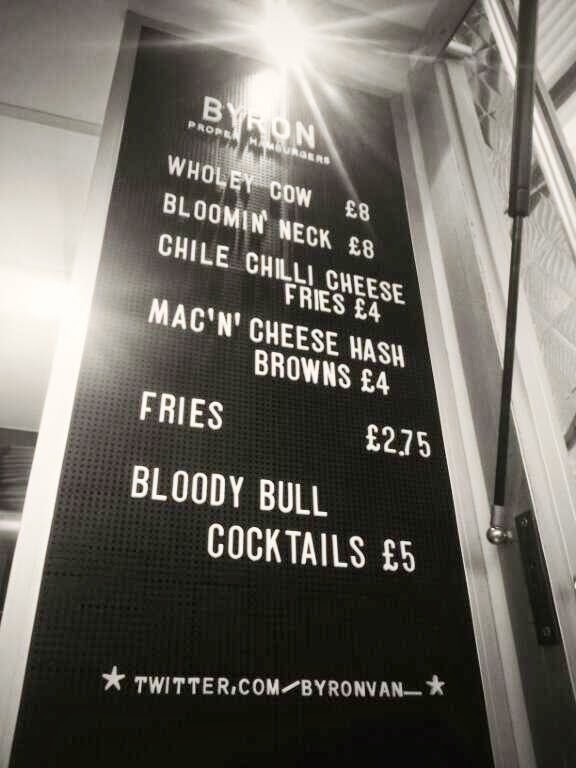 The Bloomin' Neck burger stood out for me - 8oz hamburger, slow-cooked shortrib, shredded iceberg, pickles, smokey onion & mustard sauce - and the mac'n'cheese hash browns were as good as they sound, though 2 for £4 wasn't great value. As more beers ran out, we decided to move on to Brewdog Camden for one final pint - look out for their new site in Shepherds Bush with 40 beers on tap that will be opening soon. As for Camden Town Brewery, they have different street food on every week (only open Thursday, Fri, Sat 12pm-11pm) though I would imagine that it isn't always quite as busy as it was at Wholey Cow. They often run fun events so keep checking the website or sign up for email updates. 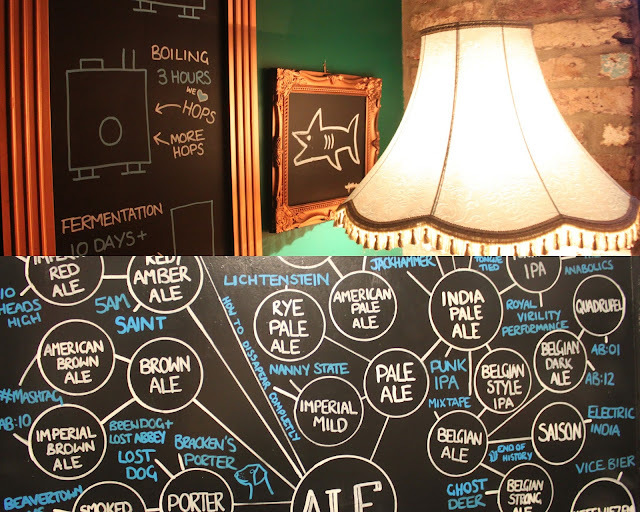 Brewery tours run every Thursday from 6-8 for £12 and sound wonderfully boozy. 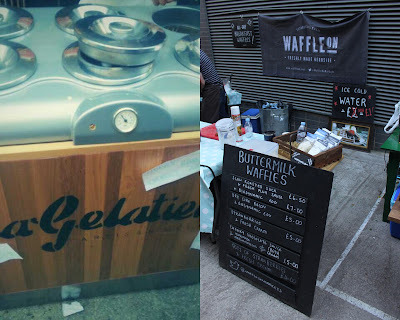 Saturday 31st August - I work at a music school on many Saturdays throughout the year, so when I have a free one I like to take full advantage of it (see Hackney big day out, Good Egg and Midnight Apothecary, and Vestal Voyages posts for some ideas). The evening was destined to end at the Old School Yard in Borough anyway, so I decided to go for another Bermondsey day taking in Maltby Street Market and some of the nearby breweries. I have already done a big brewery post before (read more here) so I'll skip over most of that. The day started, as it usually does over there, at Kernel Brewery (open 9am-3/4pm), with List regulars Luke, Lauren, Lee and Jane. 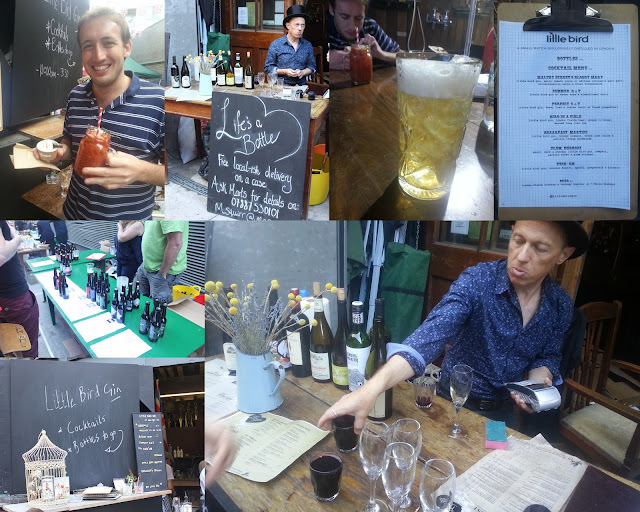 After one delicious drink, we moved off to Maltby Street Market in search of food. Just before we made it to the market, Lee diverted us into a little archway inhabited by Jensen Gin fronted by Christian Errboe Jensen himself. 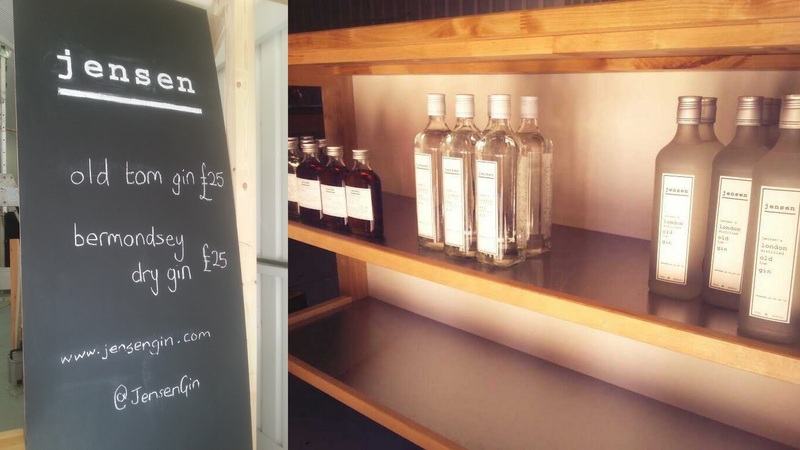 He has been distributing the gin for several years, but he is setting up a stall in Bermondsey to sell G&Ts and cocktails (some bottle aged). When we visited we were given extremely generous tasters of the Old Tom Gin and the Bermondsey Dry Gin - the former would make a mean G&T and the latter should probably be drunk on its own. The two gins were on sale for £25 each, and there were bottled aged Negronis (2 portions) on sale for £10. Christian was an engaging host and I am look to checking back in when he is fully up and running. After two unplanned shots of gin on top of a 7.1% Kernel IPA, it was definitely food time. Luckily, Maltby Street Market on Ropewalk (not Maltby Street!) 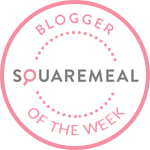 is the perfect place to be hungry. We were a little late to the party at 2 o'clock. This meant that it was not too crowded - Team Bermondsey constantly moan about how their lovely hidden market has been taken over by posh young couples, looking lost wandering around railway arches in their chinos and summer dresses. 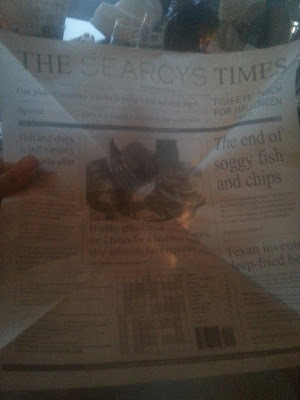 The downside was that a couple of places were starting to run out. Monty's Deli make a wonderful salt beef and pastrami sandwich but we were sadly too late for that. Instead, we enjoyed some burgers from the Woolpack - a stall from the chef at the independent Woolpack (The Wooly) pub round the corner on Bermondsey Street. 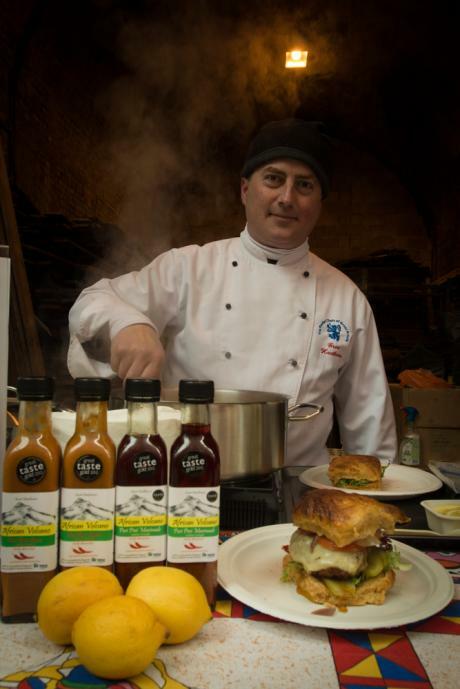 I went for a delicious beef and pulled pork burger in a brioche bun with chipotle mayo - a steal at £5. The biggest queue was for African Volcano, a street food stall showcasing Grant Hawthorne's fiery Mozambique-style Peri-peri sauces and marinades - I have it on good authority from Bermondsey locals Sam & Rich (who we found in Monty's Deli) that it is worth the wait. You are spoilt for choice dessert wise as well, with Waffle On winning the best smelling stall award. Make sure you try some of the quirky ice cream flavours from the tiny La Gelateria artisan gelato cart - Honey & rosemary was the winner for me. La Gelateria has a permanent home in Covent Garden. This leaves us with drinks. I have already mentioned Bar Tozino before (read more here) - a jamon bodega with interesting wines that opens til 10. Another wine option is Life's a Bottle (or Top Hat Man) - a great little stall serving up excellent wine at affordable prices, open 9-3. You can wander around with it, or take a seat inside one of the quirky archways filled with Lassco salvaged artefacts (head to Brunswick House Café in Vauxhall for a similar experience). There is also beer man (does he have a name?) who always has interesting bottles on offer at around £4, though with Kernel, Partizan and Brew by Numbers round the corner, I'm not sure that I would ever find myself buying something here. On the cocktail front, Little Bird Gin (from Peckham) have you covered. They have a nice little area with covered seating in the back and bartenders at the front mixing up drinks next to some birdcages. Sam went for their Maltby Street Bloody Mary which makes use of African Volcano peri-peri sauce, whilst I went for a Bird in a Field made with London Fields Hackney Hopster beer, ginger and honey. 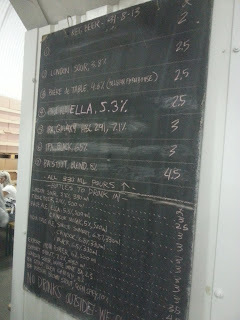 They also had a couple of London Fields beers on offer when I went for £3. As the market got quieter, we sloped off to Brew by Numbers, the brewery that stays open the latest in Bermondsey (11-6 on Saturdays). 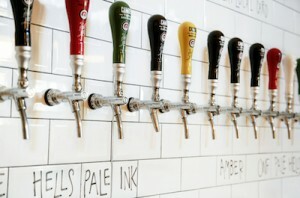 They have added in a tap since the last time I was there, and had a few more varieties on offer in the fridge as well. 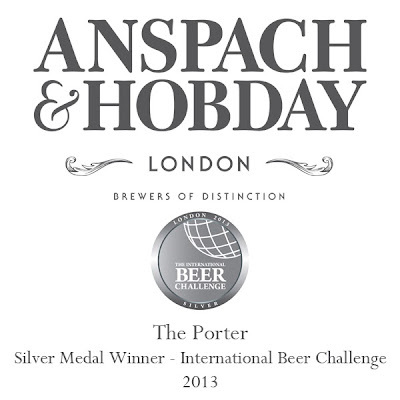 Here we ran into Anspach & Hobday, a young brewing team who we first met back in March at Craft Beer Rising on Southbank (read more here). They ran a successful Kickstarter campaign to gain some funds to get themselves started, but they are still searching for a permanent home so that they can move the brewery out of their kitchen! Bermondsey, Brixton and Peckham are all on the cards. Keep your eyes out for them - they recently won a Silver Medal at the 2013 International Beer Challenge for their Porter. After several Brew by Numbers bottles and a good catch up, Team List made their way to the Old School Yard (via a flat for a cheeky Sipsmith G&T) for one of our number's engagement party. The Old School Yard is a retro party bar in Borough that deals mostly in cocktails. 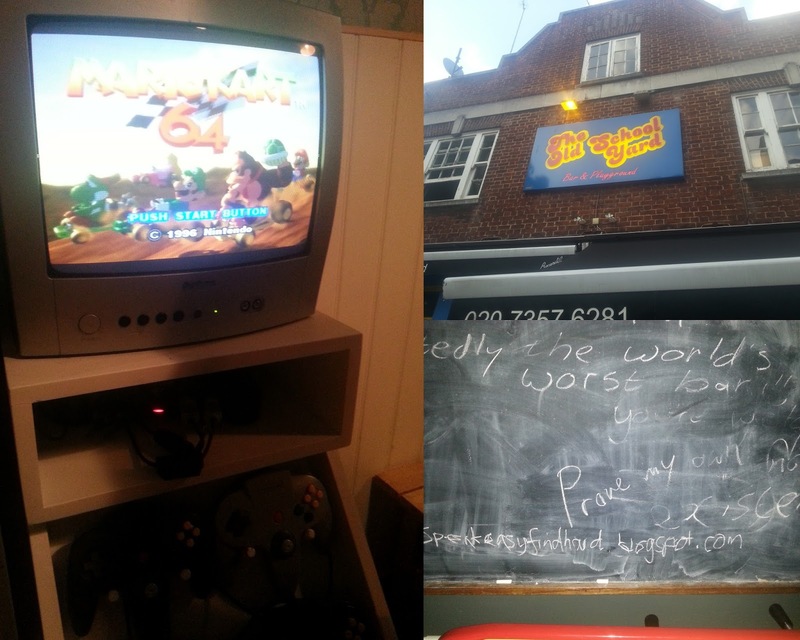 Compared to the stuff I have been having around London, the drinks are pretty substandard, but most bars don't have 4 player Mario Kart to keep me happy! Add in some arcade games, a blackboard, and wonderfully terrible music, and you can have a great night here - just don't expect miracles from the drinks! You would be wise to get there during happy hour from 5.30-8. I didn't write world's worst bar. Sunday 1st September - After another big day out in Bermondsey, I was glad that I had booked our table at the soft opening of Gin Joint for the evening. Searcy's have refurbished their 2nd floor Bar & Brasserie in the Barbican complex, with an emphasis on gin. They have over 40 gins behind the bar, with Brokers gin chilled on tap. The soft opening offer included 50% off the food bill, and a complimentary cocktail or G&T each (£9/10). Will, Luke and I were slightly underdressed, but I think we got away with it. Experienced Team List Leader Natalie came better prepared. It is a classy (and expensive) place, intended mostly for pre/post concert meals/drinks - I will certainly be heading up here to try out different G&Ts whenever I am around for a concert with my gin-loving Aunt and sisters. We got stuck into the drinks straight away, with a Gin Martini, Gincognito, Last Word, and a Chase Apple Gin and Tonic. Whilst Natalie wasn't terribly impressed with her Last Word, the rest of us were extremely happy. 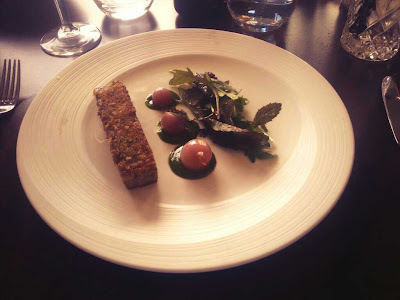 With the 50% off, we decided to go for all three courses, which proved to be a wise choice. Starters - Gressingham Duck Sausage with pickled shallot, scallop and juniper; Foie Gras with grapes, harissa and toast; King Prawn Cocktail with black pepper croutons and avocado sorbet; Marinated Vegetable Salad with Somerset goats' cheese and hazelnuts. Everything was beautifully presented and received two thumbs up. Next I tried to tempt Luke into having the 750g beef fore rib to share but he was having none of it. 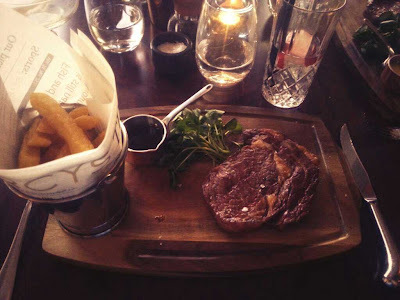 We instead each went for the 21 Day Aged Galloway Beef Rib Eye with triple cooked chips from the Bertha Grill. Luke played it safe with a Bearnaise Sauce, whereas I went for the Juniper & Pepper Corn Sauce which was nice, but wasn't in my opinion related in any way to peppercorns. Natalie splashed out on a Rack of Herdwick Lamb again with triple cooked chips which she was impressed with. She wasn't so happy to find out that they had run out of side vegetables, and her response to being offered spinach instead was amusingly, "Er no - I've already had spinach today" - you should have known that Gin Joint. Will went for the Homemade Bacon with BBQ Beans, Bantam egg and chips. 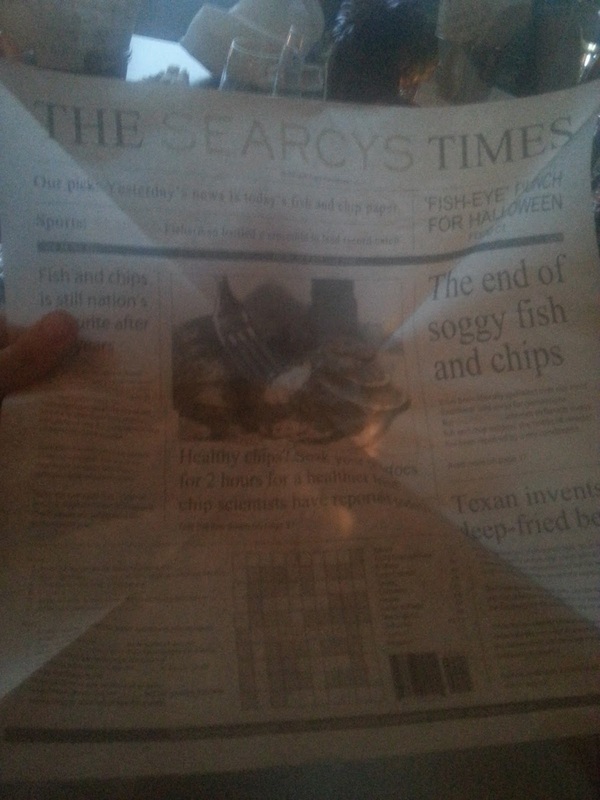 The chips were all wrapped in the fake Searcy's Times, which you could unravel and read (or even do the crossword). Last but not least, dessert and another round of drinks. Will stuck to his Gin Martinis while the rest of us went for more G&Ts - Citadelle, Geranium and Jensen's from earlier. The Geranium is really interesting and well worth a try if you spot it anywhere. You can see the full list of gin on offer here. For pudding we went for a British Isle Cheeses, Sticky Toffee Pudding with liquorice ice cream, and a Plum and Almond Crumble with star anise and orange custard. The others weren't convinced by the sticky toffee and liquorice match, but I was too busy scoffing my superb crumble to care. All in all, we were very impressed with the drinks and food, though it would all have been too expensive for us without the 50% off and free drink. I would recommend going in the evening, as the views out to the Barbican are vastly improved at night time! Get there between 7-9 to have any of the G&Ts on offer for £8.50. It is a great shame that they still have the same old horrendous toilets round the corner, which do not do Gin Joint justice. If you are just after gin without the food, then I would suggest also going to the London Gin Club at the Star at Night (Oxford Circus), 214 Bermondsey (underneath Antico), or Drink, Shop & Dance (underneath Drink, Shop & Do in King's Cross). City of London Distillery also have a wide range of gins, but I haven't been there yet, and I also hope to go to the Sipsmith Distillery tour soon which runs on Wednesdays from 6.30-8. Happy Gin hunting!